Your security depends upon having a well trained security guard who is vigilant, reliable, able to solve problems, and equipped with the technology and tools required to maintain your peace of mind. 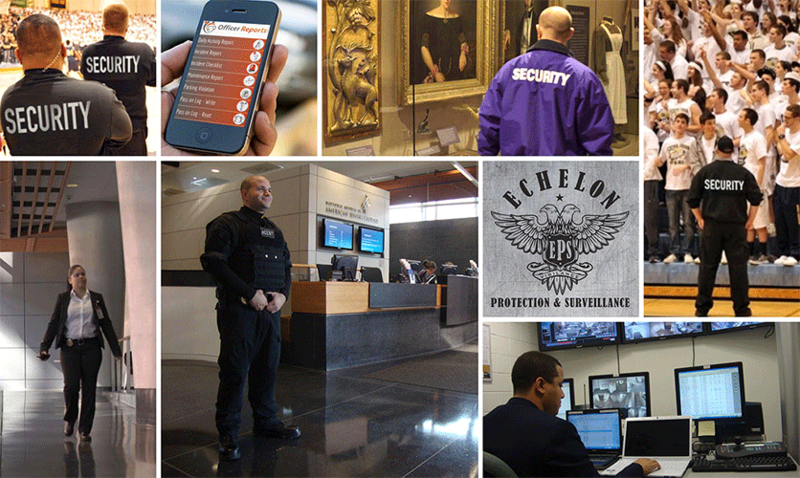 At Echelon Protection & Surveillance, we can develop a customized security plan that meets your needs using certified armed and unarmed Bethlehem security guards. In today's uncertain world, a professional security guard must be more than a just a person in a uniform - They must also ensure the protection of your property and personnel. Our Bethlehem armed and security guards, and Bethlehem unarmed security guards, must meet stringent qualifications to be a part of our team. We also ensure that our security guards are equipped with the equipment they need to realize your unique security protocols. Bethlehem Unarmed Security Guards From education facilities to personal protection, there are a number of situations where Bethlehem unarmed security guards are required. 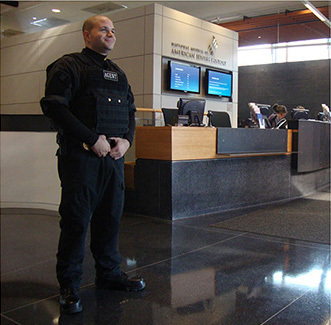 We offer quick, affordable, and reliable solutions for any situation requiring highly-trained Bethlehem unarmed security guards. Bethlehem Armed Security Guards The volatile nature of our modern world sometimes demands Bethlehem armed security guards to ensure the safety and protection of both people and property. Our Bethlehem armed security guards are trained by law enforcement experts, which makes them ideally suited for situations requiring immediate response. Contact Echelon Protection & Surveillance and let us help you develop a security plan focused on meeting your specific needs with both unarmed and armed Bethlehem security guards you can implicitly trust. Bethlehem, Pennsylvania, has also been called Christmas City, USA. In 1741, more than 250 years ago, Bethlehem was established when a religious group, who members of the Moravian Church, bought some property where the Monocacy Creek runs into the Lehigh River. On Christmas Eve in 1741, Bethlehem was christened in a stable while the small group of members of the Moravian church sang hymns. Bethlehem has a very interesting history. The first Moravians felled some white-oak trees and started establishing their settlement on the 500-acre tract of land that they bought in the spring of 1741. They located their industries, trades, and crafts, next to the Lehigh River and Monocacy Creek and their institutional structures were located on the limestone bluff next to what is currently known as Church Street. Hewn logs were the materials used to build the earliest structures. Although the first home no longer exists, the second building that was built known as the 1741 Gemeinhaus, which is currently a National Historic Landmark, and is still standing and is home to the Moravian Museum of Bethlehem. During most of the 1700's colonial Germanic stone buildings remain, including the archeological remains of an old mill, a pottery, a dye house, and a butchery. These structures are considered some of the best American colonial Germanic architecture during the 1700's. Fortunately, Bethlehem is the home of two National Historic Landmarks, which are the 1762 Waterworks which is the first pumped municipal water system in America and the 1741 structure, known as the Gemeinhaus, which is the largest log building in continuous use in America during the 1700's, and was the birthplace of the Father of American Mycology named Lewis David von Schweinitz. Bethlehem was considered a diverse settlement with members of the Moravian church arriving from all around Europe. Some 15 different languages were spoken in the settlement, although German was their common language. Education for both girls and boys was very important and they first developed a school for girls and many months later they developed a school for boys in 1742. These schools have come to be known as the Moravian Academy, which is an independent school for students between pre-Kindergarten and grade 12. They also developed the Theological Seminary and the Moravian College. Originally, Lehigh University was established fir the training of future leaders of industry and was built during the 1860's. Another discipline that was very important to the settlement was music. In 1774, one of the earliest orchestras was established in Bethlehem. These days, the Moravian Trombone Choir and the Bach Choir of Bethlehem were two of the oldest musical groups in America and were established in 1754, and they both continue that tradition. Although they doubled their output of hides in order to support the American Cause the Moravians were pacifists during the Revolutionary War. The Brethren's House in Bethlehem was the home of the Continental Army Hospital. More than 500 soldiers died in Bethlehem and are buried on the hillside next to what is currently known as First Avenue. The story of Moravian farming currently exists in the historic location called the 1748-1848 Burnside Plantation that, within the city limits of Bethlehem, interprets early farming. Bethlehem started changing during the late 1820's, with the advent of the canal. The Moravian Church owned all of the property during the early years, and Bethlehem was a closed community. The year 1845 brought the incorporation of Bethlehem as a borough and the Church started selling its land. During the middle 1800's, the development of the railroads in the resulted in the increased development of industry that began with zinc, then steel, and iron silk mills and cigar factories. Located on the southside of the river, the Moravian farms were converted into building lots and a place for industry growth. Many thousands of immigrants from all around Europe and later the Americas arrived on the southside to work in the mills and factories during the 1850's. Once again, many ethnic traditions and languages could be found in the community. The year 1865 brought the incorporation of South Bethlehem as a distinct borough. During the late 1800's, the population of west side of the Monocacy also increased quickly once the Broad Street Bridge was finished being constructed, and then, in 1866, West Bethlehem was incorporated as another distinct borough. The three boroughs were combined into one community in 1917. According to Money Magazine, Bethlehem is one of the 100 Best Places to live has a very active culture and arts scene, has many museums and historic sites, and has six districts that are on the National Register Historic Registry. A small group of members of the Moravian church arrived close to the Monocacy Creek on the banks of the Lehigh River that same year. The Unity of the Brethren was established in 1457 by followers of a Roman Catholic Priest, named John Hus, who had attempted to reform the Catholic Church. A full century before the Reformation of Martin Luther King, Hus was burned at the stake for his beliefs. His followers named themselves Moravians since several of the original founders were from the provinces of Moravia and central Europe in Bohemia, in what is currently known as the Czech Republic.